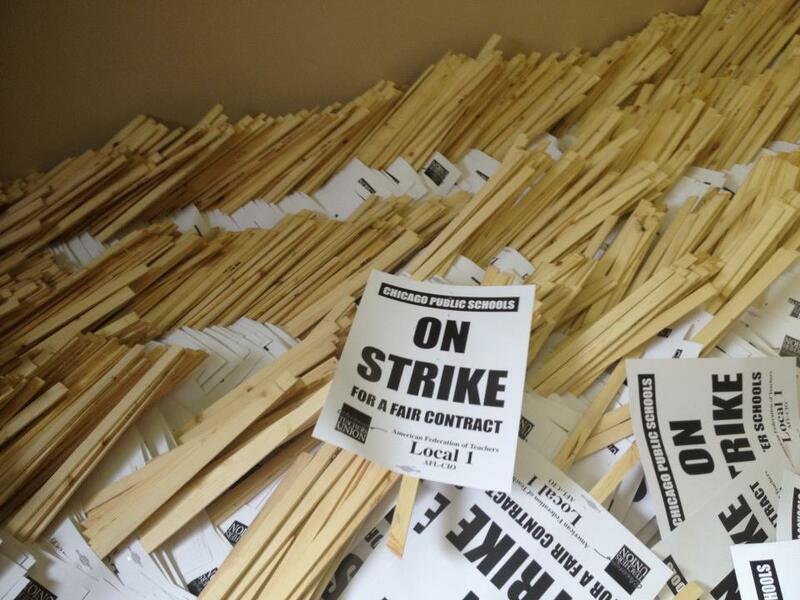 On Monday, September 10, 29,000 of our Chicago colleagues went on strike after they failed to reach an agreement over education reforms sought by 1% Mayor Rahm Emanuel. Twenty-five years have passed since Chicago teachers last went on strike. The reforms sought by Emanuel will be no surprise to those who have followed the corporate education “deform” movement: teacher evaluations and teacher pay tied to standardized test scores, longer school days to allow more time for testing, closing schools and turning them over to charter operators, and provisions that slash health benefits and seriously curtail job security. Rethinking Schools, along with the National Network of Teacher Activist Groups, is standing in solidarity with Chicago teachers as they fight for the future of public education. Why? Because their fight is our fight. What is happening here in Chicago is also strategically significant nationally. [Chicago] was the birthplace of the neoliberal, corporate, top-down education reform agenda—privatizing public education, closing and sabotaging public neighborhood schools, high-stakes testing, paying teachers based on test scores—that whole agenda. And Chicago is now the epicenter of the fight back against it. What happens here in Chicago will really have an implication for whether we are able to turn back this national agenda. We’re striking for a lot of reasons. If you just see what’s in the mainstream media, all they talk about is that teachers want more money. But that’s really far from the truth. We’re fighting for reasonable class sizes. We’re fighting for wraparound services for our students. I teach in a school with a thousand students; we don’t even have one social worker in that building for most of those kids. So we’re fighting for the education our students deserve in Chicago. We’re fighting against reforms that we see, from the classroom level, are not going to work. Phil also explained on the show what it means for teachers when their pay is tied to high-stakes standardized test scores. At my school, I looked at the calendar for the year, and there are about 15 days where students are being tested on standardized tests. These tests are not designed to help the students. Many of these tests are designed because of No Child Left Behind to measure the school. And now, because of Race to the Top and these new reforms, now these tests are being used to measure teacher performance. So what does that mean? It means that rather than planning rich-inquiry, interesting lessons for our students, we have to focus on very specific tested standards in a very narrow way. . .
To give an absurd example, this week I’m supposed to give a district-mandated test to my 9th-grade biology students, who I’ve known for one week, on DNA-to-RNA transcription and translation in protein synthesis. The reason they’re getting this test, on material they’ve never seen before, is so that I can be measured from the beginning of the year to the end of the year. . . . It’s an insane way to try to measure teachers. It’s clearly sort of the business model, the corporate model of people who don’t understand the classroom, saying, “Oh, we’ll test them at the beginning of the year and the end of the year and see growth.” But it’s an absurd sort of test that is not going to work even for that purpose, and it’s certainly not going to help our students. Read “Neither Fair Nor Accurate” by Wayne Au for more reasons why it’s a terrible idea to link pay to standardized test scores. Chicago teachers have worked diligently over the past several years to develop deep ties to parents and the community, and it’s paying off now. Goodman invited local school councilmember and parent Matt Farmer on the show to comment. I support the efforts of the Chicago Teachers Union in this labor negotiation, because I believe they are fighting to make schools in Chicago better for all kids. The reason I say that is because the mayor talks at length about providing a “world-class education” for Chicago’s kids, but what we know is that the mayor’s kids are getting one at the University of Chicago Laboratory Schools. Why, we should ask, aren’t the reforms the mayor is trying to push through the same as those that are working at the lab school? More art, more music, libraries for kids—those are not the types of resources and classes that we are seeing. Listen to or read the transcript of the Democracy Now! segment about the Chicago Teachers’ strike. If you want to show your solidarity with the Chicago teachers, start with the National Network of Teacher Activist Groups. They have organized a campaign, Solidarity with Chicago Teachers, where you can find up-to-date information on what’s happening and pledge your solidarity by posting a testimonial; teaching a related lesson; organizing discussions and solidarity from your union, school, or education program; and/or contributing to the CTU solidarity fund. From our fall 2010 issue, this interview with Chicago Teachers Union president Karen Lewis and teacher activist Jackson Potter provides important context for the current struggle. Bob Peterson, Rethinking Schools editor and co-founder, and president of the Milwaukee Teachers’ Education Association, says “enough is enough,” and explains the many reasons why he is standing in solidarity with Chicago teachers, and urging his union members to do the same. This is a powerful and eloquent explanation of “Why I’m Striking” by Chicago teacher Xian Barrett. The Chicago Teachers Union website, Twitter feed, and the Chicago Teachers Solidarity Campaign Facebook page all have accurate and up-to-date information. Posted on September 12, 2012 by Rethinking Schools	This entry was posted in Current events, Testing and tagged Arne Duncan, bargaining, Chicago strike, corporate ed reform, CTU, evaluation, high-stakes testing, privatization, Rahm Emanuel, teachers strike, unions. Bookmark the permalink. Thank you for not just opining from the comfort of your keyboard, but providing informative interviews from the ground level, as well as additional resources and ways to get involved. The teachers are right to resist. Policy advocates and politicians have intervened without knowing how to make these changes to a very effective and hard working teacher corps. http://www.teacherevaluation.net has plenty of technical reasons this “reform” effort of principal reports and student test scores cannot provide accurate classroom data. Even with good technical changes the sociological and political problems of increasing “teacher evaluation” without knowing how to do it are overwhelming.